Olympic gold medals… yeah, whatever! But as a kid, you won the JSE Schools Markets Challenge when you were in Grade 11! Now that’s impressive! In this country, we only have two [people who make a living from swimming], Chad le Clos and I… We can comfortably compare our income to a Springbok rugby player. [What would you do if money was no object?] I know it sounds cheesy… but I do a lot of work with my charity ‘Steps’… For only R2500 you fix a kid with clubfoot when they are born… it’s when the feet are inversed… probably something like that. Each week The Money Show’s Bruce Whitfield interviews a famous person about her or his attitude to money (hopes and fears, successes and failures, etc.) as part of his weekly “Make Money Mondays, Personal Edition” feature. This week he interviewed Olympic gold medallist swimmer and world record holder Cameron van der Burgh. 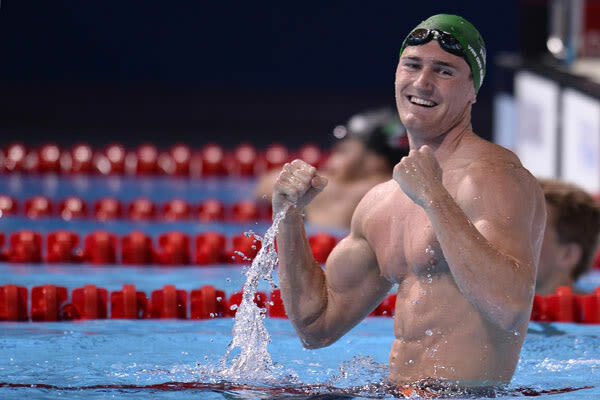 Van der Burgh is the first-ever African world record holder to train at home. He has two Olympic medals. At the 2012 Summer Olympics, he broke the world record to win a gold medal in the 100-meter breaststroke. In 2016 he won a silver medal in the 100m breaststroke. In 2012 Van der Burgh’s manager – fellow Olympian swimming legend Ryk Neethling – revealed that Van der Burgh’s earnings from sponsorships alone could amount to R4 million per year. What does Van der Burgh believe about money? Does he spend like crazy or save compulsively? How did childhood experiences shape his views about money? For my birthday, my parents use to give us R1000! We were quite fortunate. I asked my mother to give it to me in R10 notes so I could feel super rich. I never made any silly purchases… very geared to saving and investments… It’s a principle I’ve always had. Buying my wife’s wedding ring [when asked about the best thing he’s done with money]. My biggest extravagance… I do love to travel and I do love good food and good wine… You create memories and make good friends… I refuse to spend money on business class flights. They are so overpriced! Is solo adventurer Riaan Manser as crazy as he seems when it comes to money? Bruce Whitfield interviews Manser about his attitude toward money (hopes and fears, successes and failures, etc.). The Money Show’s Bruce Whitfield interviews Maponyane about his attitude to money (hopes and fears, successes and failures, etc.). The Money Show’s Bruce Whitfield gets the former 702 presenter to open up about money. The Money Show’s Bruce Whitfield interviews Morton about his attitude to money (hopes and fears, successes and failures, etc.). Olympic gold medallist Ryk Neethling talks about his evolution from world record holder to prosperous property developer.